With less than five minutes gone from the first-quarter clock Friday in Alamogordo, the scoreboard read 12-0. And not in favor of Class 5A’s top-ranked team. The Alamo faithful were roaring their vocal approval. The Tigers were feeling their oats, gesticulating first downs and signaling for the crowd to maintain its volume. A touchdown to start the game and a second quick score on a turnover inside the Artesia 10 had turned a pleasant evening in the Tularosa Basin into a hotbed of hostility in a heartbeat, an eventuality that would have left many teams shell shocked. But the Bulldogs calmly took the field and, by halftime, the lead. They generated the offense the Tigers best allowed, compiling – for the first time in recent memory – triple the amount of yards on the ground they did through the air. In short, they adjusted. And the scoreboard followed suit as the ‘Dogs capped off their 2016 regular-season slate with a 48-35 win to improve to 6-1. 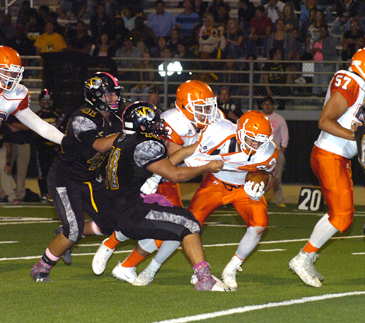 “I thought it was a really great effort by our guys to be down 12-0 to start the game and not really let that faze them,” Artesia coach Rex Henderson said Saturday. “They just believed in what they were doing and kept doing it, and we were able to get right back in it. 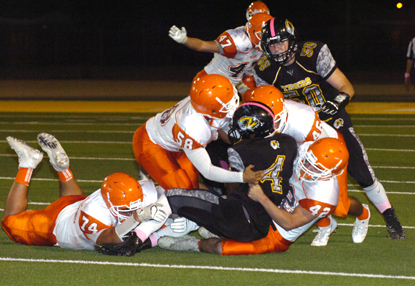 Starting from their own 36 following the opening kick, Alamogordo had marched to a first down at the Artesia 12 using a solid mix of running back Dee Smith’s legs and the arm of senior quarterback Kyle Hooper. On third down from the seven, Hooper dialed his own number for the opening score, left at six after a failed PAT. One play later, the Tigers were back in the red zone. Jalen Bateman. Another PAT attempt sailed wide, and the score was 12-0. The Bulldogs opted to introduce Alamo’s defense to the triple threat of running backs Isaiah Weideman, Robert Fernandez and Ryan Gallegos on their next drive, and it would turn out to be the start of a not-so-beautiful friendship. Weideman secured a first down on an 18-yard run, and Fernandez and Gallegos teamed up to log another at the Tiger 30. From there, a Weideman run and subsequent facemask placed the ball at the three, and Fernandez charged in from there to bring Artesia back within five, 12-7, with 4:56 to go in the first. 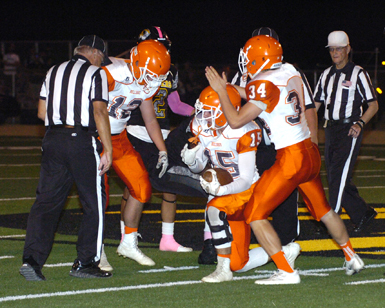 The Orange Crush would keep the momentum going as Chase Thompson recovered a Smith fumble at midfield, and the Bulldogs carried a 10-play, 51-yard drive into the second quarter before Null found Kameron Aguilar in the end zone on fourth down to make it 14-12. 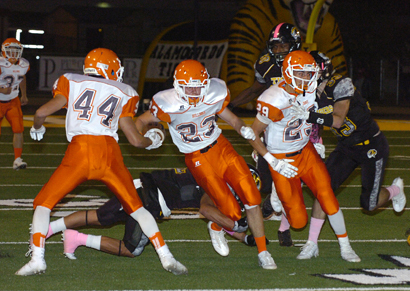 Smith made amends for the cough-up in the Tigers’ next series, however, single-handedly moving from the Alamo 42 to the Artesia 15 on five carries. The Crush was able to bring about fourth and three from the 10, however, and the Tigers opted for a field goal, which Brett Money delivered from 27 yards out to put Alamogordo back on top, 15-14. The boys in black and gold then expanded their advantage back to a touchdown following an Artesia three-and-out when Alex Ramirez delivered a halfback pass to Bateman, who darted 79 yards for the score to make it 21-14 with six minutes to go in the half. Once again, however, the ‘Dogs’ recovery time was short, as Weideman and Fernandez moved the offense into Tiger territory with a pair of first-down runs and Null hit Tyler Greenwood for a 25-yard gain to the 18. Null found Chaney Hardt for 10 more to make it first and goal at the eight, and on fourth down from the one, Fernandez stormed the goal line again. 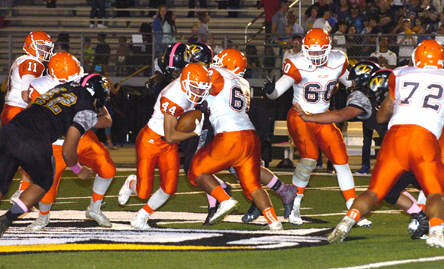 The low PAT kick was blocked, however, keeping Artesia a point behind, 21-20, at the three-minute mark. Thompson would give the ‘Dogs time to change that before the break, however, intercepting a Hooper pass at midfield. An Alamo pass interference and four Weideman runs later, the Bulldogs were back at the Tiger five, from which Fernandez took it in with 22 seconds on the clock to secure the 27-21 halftime lead. The two squads would trade punts to start the third quarter, but Artesia was able to create some breathing room before the final 12 minutes on a two-yard plunge by Fernandez. Alamogordo took its longest drive of the night into the fourth and nearly lost the ball in the red zone when a bad snap sent Hooper scrambling back from the one after the ball. The senior was able to pick it up past the 10 and fling toward the end zone, however, where Bateman went up through triple coverage and caught it to bring the Tigers within six, 34-28, with 9:53 left in the game. But that was as close as they’d come. Null found open field and scored from the Alamogordo seven in the ‘Dogs’ ensuing drive, and after the Crush forced a turnover on downs at the Alamo 45, Weideman would take one in from the nine to make it 48-28 Artesia with 4:09 remaining. The Tigers were able to mount one last scoring drive that culminated in an 18-yard run by Smith before the Bulldogs ran out the clock on the 48-35 win. “We were really pleased with our defensive effort,” Henderson said. “We were able to come out and, once we made some adjustments, play pretty well against a spread offense after not seeing it for so many weeks, and one that’s really pretty good. Alamogordo is athletic and can do a lot of things, so being able to limit them like we did was a good thing. The Bulldogs finished with 444 yards of offense to Alamogordo’s 386, 336 of those coming on the ground and 108 via the pass. The Tigers passed for 211 yards and ran for 175. 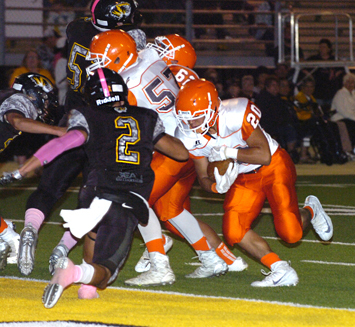 Weideman led Artesia’s big night on the turf with 158 yards and a score on 19 carries, followed by Fernandez, 13-92 with four touchdowns, and Gallegos, 8-73. Null was 11 of 20 passing for 108 yards and a TD, and Hardt led the receiving corps with six catches for 47 yards. Smith posted 100 yards rushing for the Tigers, while Hooper went 12 of 25 for 132 yards, two touchdowns, and one pick. The ‘Dogs will now have two weeks to prepare for the start of District 4-AAAAA play as they enter their open week. They’ll host Roswell High (5-1) at 7 p.m. Oct. 21 at Bulldog Bowl. 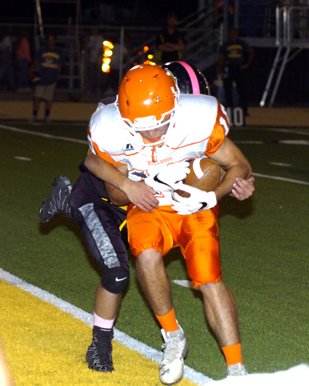 The Coyotes, who had their open date Friday, will next take on Alamogordo Oct. 14 at Wool Bowl. “We’ve had a pretty good stretch of three physical football games, so the open week will be a good chance to kind of let them catch their breath and get healed up a little bit before district,” Henderson said. “From here, we just have to keep working on getting better at the things we do – defensively, being in the right places and reading the keys, and offensively, just making sure we’re continuing to fine tune our routes, our running, our blocking.